Creating a Scan Profile allows you to instruct Comodo Antivirus scan selected areas, folders or selected drives of your system. You will be asked to select a profile whenever you click the 'Scan Now' link on the Summary Screen. You can create custom scan profiles, to define selected disks or folders to be scanned and the created scan profile can be re-used for any desired scan event i.e. 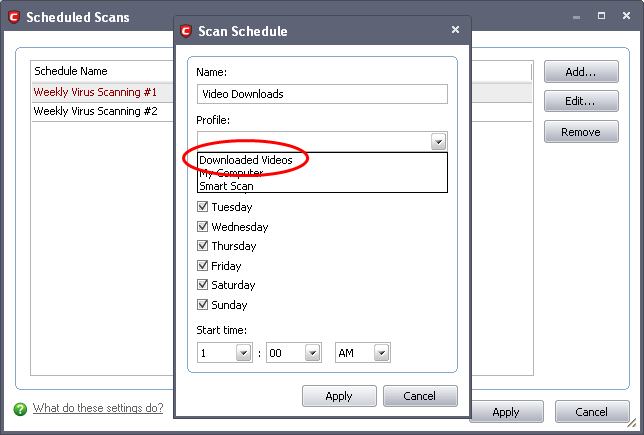 Run a Scan (On-Demand Scanning) and Scheduled Scans. You can create as many number of custom scan profiles as you wish according to the usage of your system. A Scan Profile allows you to scan only a selected area of your storage, saving time and resources. 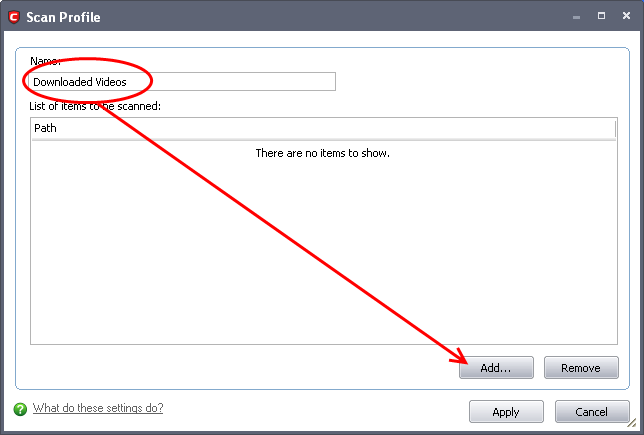 New scan profiles can be created by clicking the ‘Create New Scan’ button in the ‘Run a Scan’ panel or by clicking the ‘Add button’ in the ‘Scan Profiles’ area. 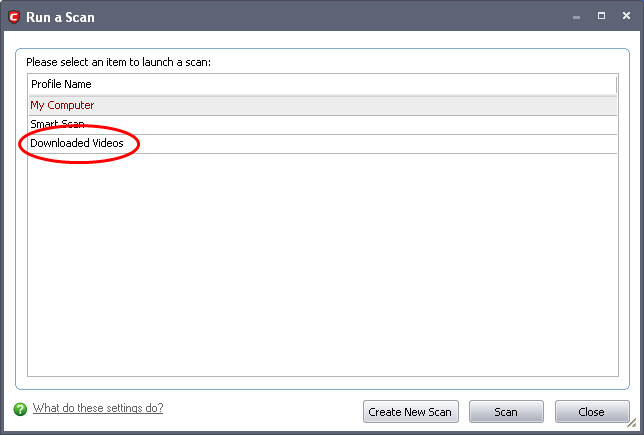 New scan profiles can then be referenced when creating a new ‘Scheduled Scan’ and as the target of an on-demand scan in the ‘Run a scan’ area. Just to clarify, AntiVirus scan profiles are purely concerned with the location of a scan, not the parameters of the scan. All scan profiles use the parameters as determined in the specific ‘Scanner Settings’ tab of that type of scan. Click 'Scan Profiles' from the main Antivirus Tasks interface. Comodo Antivirus contains two default Scan Profiles 'My Computer' and 'Smart Scan'. These profiles are predefined and cannot be edited or removed. My Computer (Default) – On selecting this, the Antivirus scans all drives on your machine. Smart Scan – On selecting this, the Antivirus runs a quick scan on the critical areas in your system which are highly prone to infection from viruses, rootkits and other malware. The areas scanned include system memory, autorun entries, hidden services, boot sectors and other critical areas like crucial registry keys in Windows registry, system files and system configuration. These areas are highly responsible for the stability of your computer and keeping them clean and sanitized is essential to keep your computer healthy and running. You can select any one of these Scan Profiles if you want to scan the respective areas. Click 'Add'. The 'Scan Profile' dialog appears. Type a name for the scan profile to be created in the 'Name' box and click 'Add'. A configuration screen appears, prompting you to select the locations to be scanned when the newly created scan profile is selected. 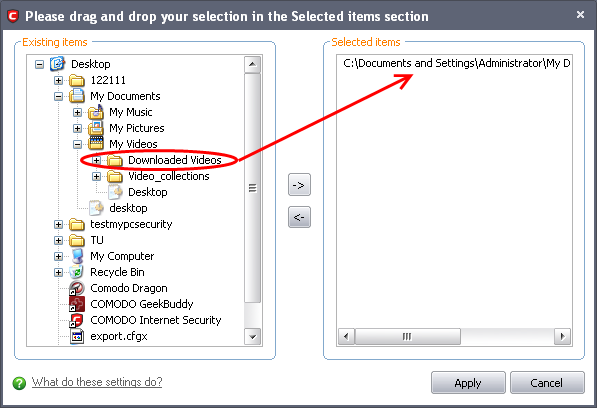 The left column displays all possible items (drives, folders and files) on your system for which scanning is available. Browse to the folder location in the left column and select the folder. Repeat the process to add more files/folders. 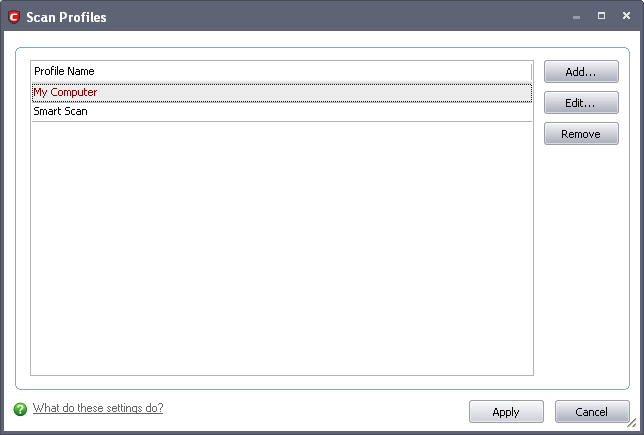 Click 'Apply' in the 'Scan Profiles' interface for the created profiles to take effect. ... and is also available for selection during scheduling a scan, in the drop-down. To edit a Scan Profile, select the profile and click 'Edit'. To delete a Scan Profile, select the profile and click 'Remove'.